What is the difference between a soulmate and a twinflame? The term 'soul mate' and 'twin soul' are often used synonymously and there is much confusion betweem the two. A soul mate and a twin soul (twinflame) are two different concepts. Throughout a lifetime one has many soulmates, but throughout eternity, one has only one twinsoul or 'twinflame'. The idea of the Twin Flame Soul Mate is often romanticaly idealized, but the dynamic of this sacred and spiritual union is based on unconditional love and oneness. Twinflame relationships can be more challenging than soulmate relationships because of the intense energies involved in preperation for the spiritual work they will do on earth. Throughout our lives we will have many Soulmates. A soulmate relationship can take many different forms such as that of a good friend, a family member, a romantic partner, or even a co-worker. Brief encounters with strangers who inspire us or help us in some way can also be soulmates who we are meant to cross paths with. The reason for establishing the relationship and the conditions surrounding the meeting is usually predetermined prior to birth. It is the Law of Karma that brings the soulmates together. These relationships exist in order to to help us grow and learn important lessons by balancing the karmic ties that have binded you together through other lifetimes. We may incarnate at the same time as many of our karmic soulmates in multiple lifetimes until the karmic energies are balanced. Soulmates can impact our lives in many ways and the relationship can sometimes end abruptly if the karma can not be resolved, or if new karmic ties are created. You may indeed meet them again in another lifetime to resolve any issues, sometimes even reversing relationship roles. Through our interactions and relationships with others we learn more about who we are. Karmic relationships give us the opportunity to grow. 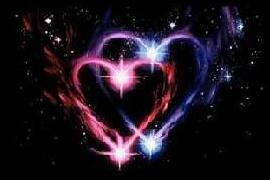 Twin flames, also called twin souls and twin rays, is 'one soul' that was split into two souls. 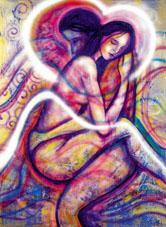 Twinflames are often referred to as being the other half of one's own soul. This does not imply that each twin is only half of a soul on earth, for each individual soul is already whole. What a Twin Flame does imply is that at one time, the two individual souls were one. We each have only one twin. In the beginning, the One soul was split into two and each went their separate ways. Each twin may continue to re-incarnate into the physical realm over and over to gather human experience and to balance karma with soulmates before being re-united with the other half of their over-soul in a lifetime. Eventually, the twinflames will merge back into the One soul that they were before the split into the two twin souls. The early stages of this reunion usually happens in both of their last lifetimes on the planet so they can complete the Ascension process together. Each twin is a complete soul, not half a soul. It is their task to become more whole together, balancing their female and male sides (masculine and feminine energies), and ideally become enlightened, before reuniting with their twin. This reunion is of two complete and whole beings. All other relationships through all our lives could be said to be "practice" for the twin, the ultimate relationship. The Twin Flame connection is the ultimate Alchemical Marriage.